German dental surgeon; born at Wesenberg, Mecklenburg-Strelitz, Sept. 22, 1849. He received his education at the University of Breslau and the Philadelphia Dental College, graduating as doctor of dental surgery in 1872. After practising dentistry in Vienna (1873) and Paris (1874) he established himself in Breslau, becoming privat-docent in dental surgery at the university of that city in 1890 and receiving the title of professor in 1896. 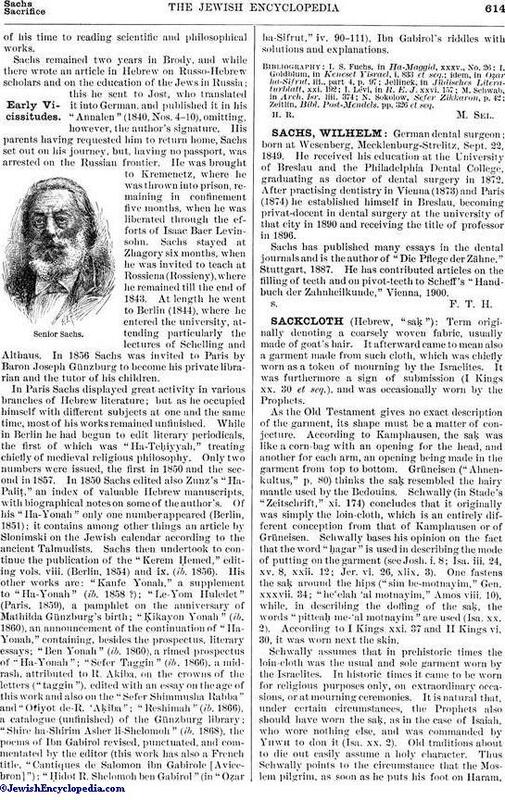 Sachs has published many essays in the dental journals and is the author of "Die Pflege der Zähne," Stuttgart, 1887. He has contributed articles on the filling of teeth and on pivot-teeth to Scheff's "Handbuch der Zahnheilkunde," Vienna, 1900.